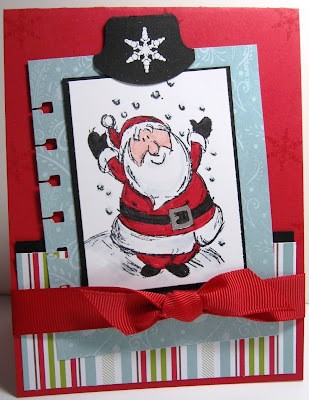 Accessories: Ski Slope DSP, Real Red 5/8" Grosgrain Ribbon, Spiral Punch, Round Tab Punch, White Embossing Powder, various Stampin' Write Markers, Dazzling Diamonds Glitter, that never shows up in pictures! I literally cannot believe that I haven't found your blog until now! You amaze me! You've been added to my faves fo' sho'! This is just darling Becky! TFS. 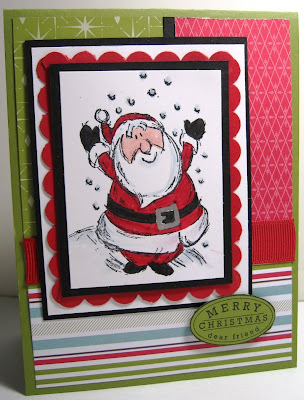 cute cards with that santa! I love it that Christmas is almost here! for the most part it brings out the good in everyone...=) at least I'd like to think. TFS! Very cute, and fun cards Becky. Smores, S'more Milk Cartons and S'more Good News! Holiday Lineup Is Going In A Time-Out!